August already! Doesn't the summer fly by. We had a cracking July in Bike Town, highlights included the Cycle Ride Leader training course and a few memorable moments at Fix Your Own Bike. We love FYOB because we just don't know who will turn up with what. It's not often you get a chance to ride your bike alongside a Commonwealth Games cycling team member carrying the torch as part of the Queen's Baton Relay. This is your chance to do so in the safe environment of Cuningar Loop. 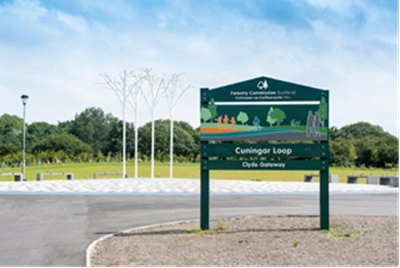 You are invited to come and join us completing a lap of the park in the company of a past Commonwealth Games cycling team member for the Queen's Baton Relay. The baton will then be taken, via the Cuningar bridge, to the Emirates Arena by the cycling team. Meet at Bike Town, in Thomson Court at 10.30 to cycle to Cuningar Loop, via cycle path to smart bridge then along the river clyde. 12.15pm : Baton is received by the Provost of South Lanarkshire and given to the Bike Town initiative of Healthy n Happy Community Development Trust to complete a lap of the park in the company of a past Commonwealth Games cycling team member. The baton will then be taken, via the bridge, to the Emirates Arena by the cycling team. 1pm – 3pm : Community event at the Legacy Hub in Dalmarnock. Everyone who takes part in the ride and event is invited to the BBQ. The baton itself will arrive at the Legacy Hub at 1.30pm. With a new Saturday meeting time added the Bike Town Belles now meets twice a month. The group will be led by the members of the group and potentially include cycle rides - both social and training rides, learning to look after your bike and anything else cycling related the group would like to do. The first Saturday meeting and ride is on Saturday 26th August from 10.15 -1pm. 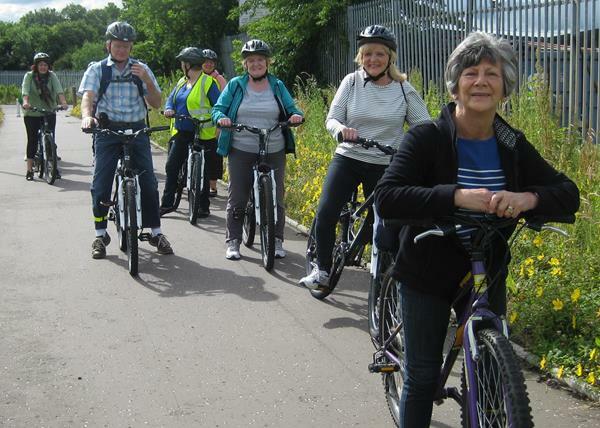 The Bike Town Belles then meet again on Tuesday 29th August at 10.15 - 1pm.. Call 0141 647 3250 or email biketown@healthynhappy.org.uk for more info. Simply bring your bike in for a service and get free automatic entry into our monthly prize draw. Congratulations to our monthly Mystery Prize winner for July - Geraldine McAdam. Jo wins a high security Bike Lock. This event is open to everyone who's happy to wield a spanner and to come and help us strip bikes down to their component parts - free tea, coffee and biscuits - who knows there may even be cake! Come and join us even if you only have a hour or two to spare. Helping behind the scene n the office. Bike Town is back again for this our third year at Cambuslang Park for the Annual Fun Day. Bike Town guided rides have additional support from cycle ride leaders employed to 'guide and lead' the ride and are therefore suitable for new and less confident cyclists. Our social rides are self supporting and run by volunteer ride leaders. Participants on social rides are should be able to cycle and to have the skills necessary to keep themselves safe cycling on multiple terrains. No Bike - No Problem: Loan bikes are available for ride participants. Arrive at 10am if you wish to borrow a bike. Our Wednesday rides depart at 10.15am from Bike Town. We stop midway for the essential cafe break and aim to return by 1pm. Once a month we offer a longer-distance, faster-paced Go Further Thursday ride, suitable for people looking to extend their cycling experience. We cycle between 20 and 30 miles and aim to return by 3pm. Need to fix your bike but lack a few essential tools? Or would you like an expert on hand to give a little guidance, reasurance and support? £5 per hour for use of a bicycle stand, tools, lubricants and all the tea and coffee you can consume. Last month we helped with fitting new brake pads to disc brakes, firring a new chain, adjusting gears and taking pedals off. If you have a larger project like rebuilding a bike then get in touch, we can help you with a stand for a half or full day session.